Every year the Scout & Guide Christmas Post is organised in Wirral. The scheme is an alternative mailing service for Christmas cards sent to people within the Wirral boundary. Everyone can buy special Scout Christmas Post stamps and use them to send Christmas cards (only) to friends and relatives in Wirral (only). The cards can be posted in special Scout Posting Boxes from where they are collected, sorted and delivered by members and friends of the Wirral Scout Groups. There are lots of outlets within Wirral where you can buy stamps and post cards. Each Group receives a portion of the money collected from stamps sales according to the number of stamps sold by the particular Group and the number of cards they deliver in their local area. For more details about the scheme, click here to visit the Scout Post website. 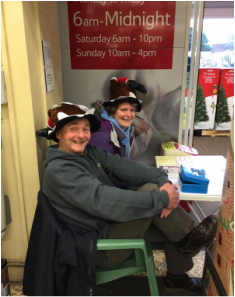 We always take part in the Christmas Post and as our biggest single annual fund-raiser, it is very important to the financial viability of our Group. Each year we manage to sell about 25,000 stamps and deliver about 15,000 cards and as you can imagine, this takes a lot of effort. Our main stamp-selling effort occurs in Tesco, Heswall, over about 4 weeks usually starting towards the end of November. We normally have about 15 or 16 four-hour slots, which can be 9am to 1pm, 1pm to 5pm or 5pm to 9pm. Card-sorting usually starts in second week of December and lasts about 2 weeks. We sort at our scout hut each night from about 7:30pm. We also have to send two people to District HQ each night to help with the main sorting. Deliveries take place over two weekends, usually the two immediately before Christmas. We do get good help from our supporters and parents, but obviously the more people who help, the lighter the individual load, so please try to find some time to help sell stamps, sort the cards and of course with the deliveries. Even an hour or two would be really useful.